"I'll be honest with you. The Full English is good, but it's not £9.00 good. Now the smoked salmon and scrambled egg is better value at £8.00 – it's quite substantial, you get a bit more for your money". It was half past eight on a Friday night in Euston station and, as we stood outside our cabin and room for the night, our train guard, Robert, gave us a thorough rundown of our breakfast options for the following morning. "And then you've got porridge with honey, granola with yoghurt. Four porridge and four coffees? No problem at all. And what time would you like to to come and wake you up? We're due in at 8:38am, so a knock and breakfast at 07:30? Perfect". Single file, heads bowed and torsos angled slightly off centre, we walked down the narrow corridor of the Caledonian Sleeper Train, squeezed into our four bunk room and climbed into our beds. We were heading for The Scottish Highlands and, by the time the sun was up and Robert was bringing us our breakfast, we'd be there. It wasn't all that long ago that this trip was just a proposition; a precarious pipe dream that was always intended but never quite executed. 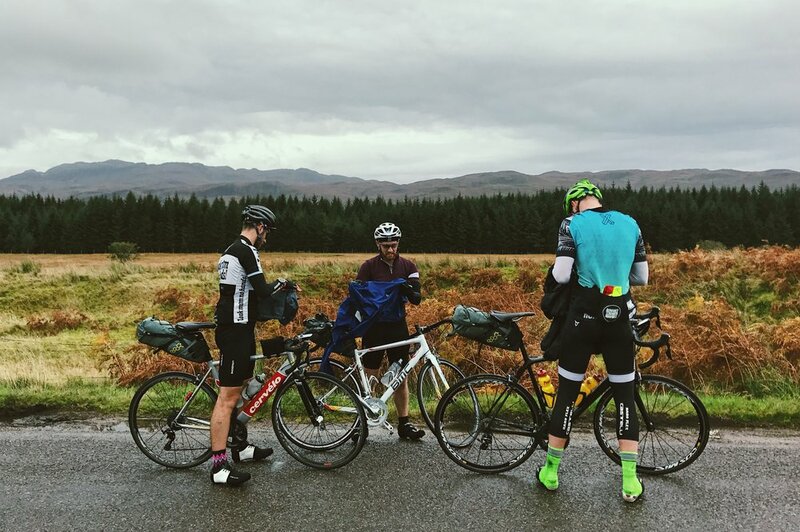 The four of us had been looking at taking on The North Coast 500 by bike for a few years, but it took the prospect of one of us leaving the UK to force us into action. And even then we were a little too late; available holiday was few and far between and we'd slipped into the portion of the year where the weather had become even more temperamental than usual and daylight had dwindled. 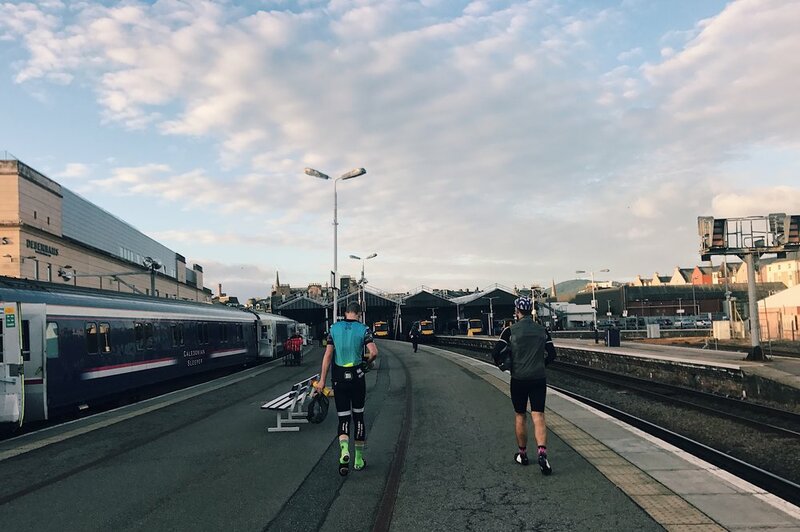 So it was with smiles on our faces and a sense of relief that we rode out of Inverness, passing its expansive lochs under blue skies and a bright, low-lying sun. A-roads and lanes are one and the same in these parts and it wasn't long before the slow trickle of traffic dried up. Any obvious signs of inhabitants became sparse – a farm house here and a seemingly unreachable cottage there were fleeting specks on otherwise rugged and weathered hillsides and moorlands. It was somewhere between 70 and 80km that we saw the first building that might serve food. We were keen to push on into what was our longest day of the three, but no one liked our odds on finding anywhere else in the next few hours and, more importantly, before the biggest and toughest leg of the day. Wheeling up outside Ledgowan Lodge Hotel, we clopped and clattered under the watchful gaze of stuffed deer heads and what looked to be the hotels only two guests to their reception. Not looking at our watches, it's difficult to know how long we spent in the high-ceilinged, empty-except-for-us dining room, but if food and drink is an acceptable unit of time, it was a sandwich and two pots of coffees. Whatever the unit of measurement, it was long enough for the weather to swing from the bright and sunny to the wet and misty. To begin with, it wasn't raining – the air was just wet. The mist combined with forward momentum to slowly but surely make sure every accessible inch of us and our bikes became suitably saturated. 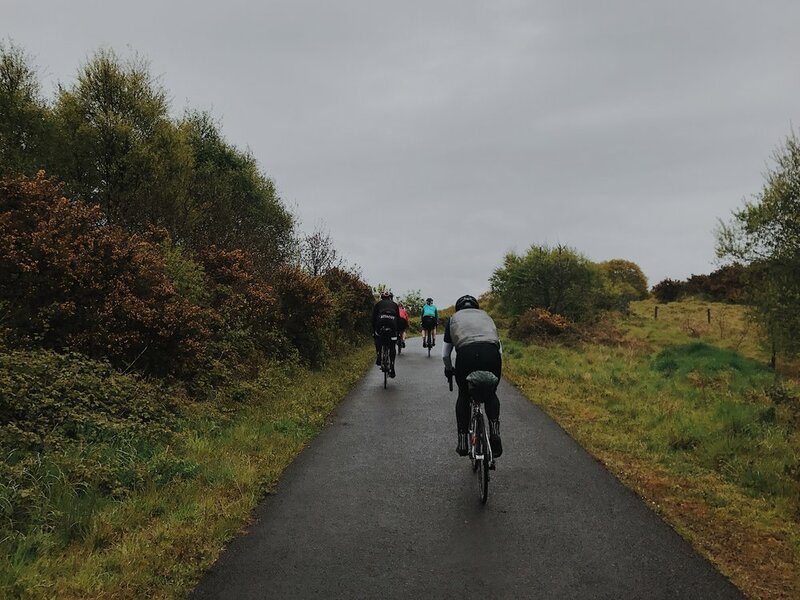 As we pedalled on, the wet air became more assertive, transforming from droplets into globules that were unarguably heavy rain. A well-timed puncture made sure we were able to appreciate it in all its torrential glory. "Whatever happens, we have to do the longest route option on day one. It's the only way we'll be able to do Bealach na Bà". Fickle weather and limited light meant Hendo, our routemaster, had planned several routes for each of our three days in The Highlands. Knowing our options to get back to our starting point were limited beyond the bike, it gave us contingency plans should we need them. But there was one iconic climb we refused to side-step having come this far: Bealach na Bà. 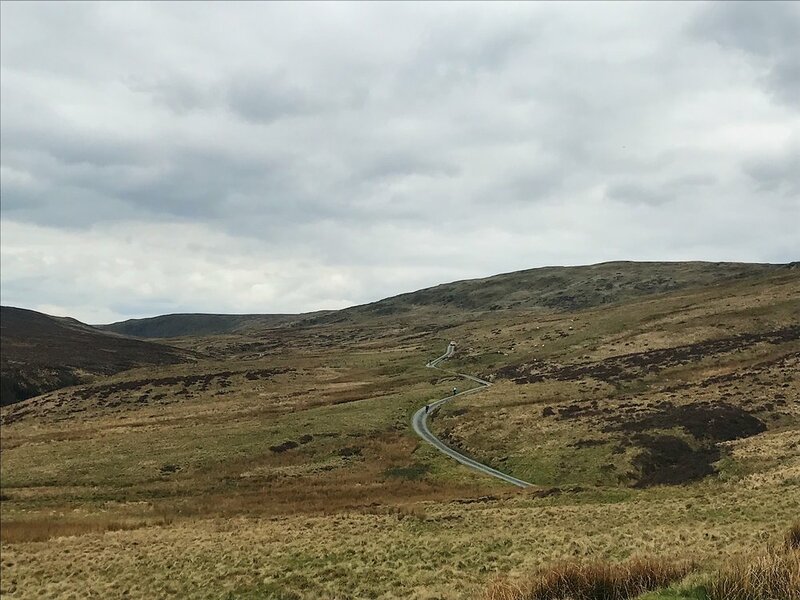 Otherwise known as Applecross Pass, this almost-10km stretch of ascending, winding tarmac is widely billed as the toughest climb in Britain. With 120km in our legs and our ham and cheese sandwiches having just begun to settle, we reached its base. The climb is a con man. And like any con man worth their salt, it introduces itself amicably, a gentle, steady climb taking you up and away from Loch Kishorn. You warm to it; almost start to enjoy it. But despite the friendly introduction, the early warning signs are there, forcing you to quieten the voice in your head that's telling you it might not be as bad as you thought. "Road normally impassable in wintry conditions" read a red, all-caps sign next to an open gate that felt as though it might be closed at any minute. It was just before the halfway point of the climb, where the road took a harsh right-hand hairpin, that the climb showed its true colours. And, after 20 minutes of grinding and pedal dancing, you could see in no uncertain terms just how far away the top of the climb remained. I let out a groan as the weight of my saddle bag and the harsh gradient of the climb forced my front tyre from the tarmac in a momentary wheelie. My knuckles whitened as I gripped my handlebars tightly to counteract the strong wind that was determined to turn said wheel to a 45 degree angle. I watched as cars carefully crawl pass me. I wondered how feasible holding onto the side of a vehicle and letting them drag me up was. Approaching the final three hairpins of the climb, I looked back over my left shoulder at what we'd left behind. If the process of reaching the top of this climb hadn't devoid me of almost every molecule of oxygen floating through my body, what lay below might have taken my breath away. A harsh cliff face plummeted into a valley where a river ran like a loan vein back toward the loch we'd left behind and below in the distance. In another context it might've been beautiful. In this one, it was drowned out by the sound of my heart beating in my ears, the ruthless wind whistling round them and obscured by the burning sensation in my eyes from the sweat as it relentlessly ran into them. Despite beginning to imagine there wasn't one, we reached the top of the climb. Although after such an ordeal, it feels fairer to call it a summit. It was windy up there too. We were blown about as we admired the views into the valleys below and watched the clouds move quickly across the sky (which we weren't so much below as in). And so to the fruit of any labourious uphill labour: the descent. A smooth and narrow road traced the side of the mountain over 10km. It unfolded smoothly before us. There were no surprises. Every turn could be suitably anticipated; every straight prepared for. There were no cars obstructing the route to the bottom. Nothing slowing us down on the gleeful race to our second food stop. Apart from a puncture 500m out. But not even that could ruin the journey back to the bottom. 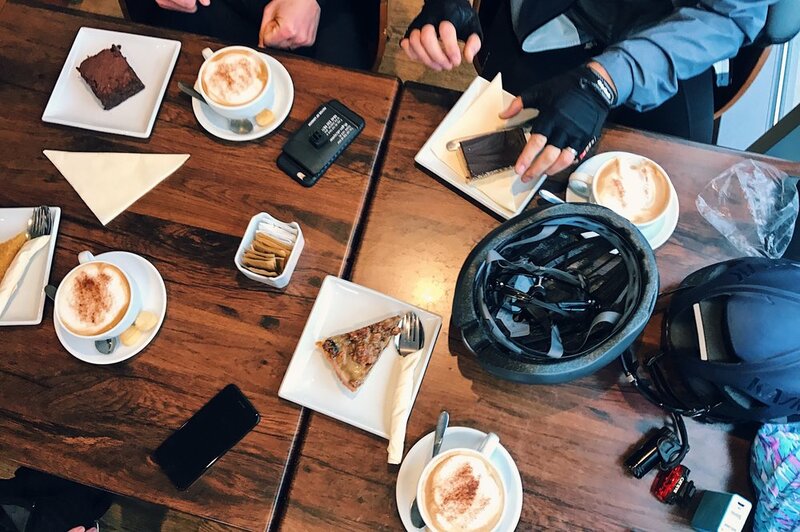 The adrenaline rush of the descent, the caffeine kick from the round of cappuccinos and the sugar spike from a hefty wedge of cake at our second and final stop were all short lived and did little to bring us back to life. As we sat around the table and made sure our lights were ready for the inevitable ride into the dark, we sighed, we shook our heads, we raised our eyes to the ceiling and, every now and then, we looked at each other and laughed. We were down, but not out. We worked our way along Scotland's undulating west coast. Snaking in and out from its shoreline, we did our best to avoid the increasing number of sheep sitting by the side of the road. They were coiled springs; nervous, on edge and ready to bolt across our path at any given moment. The large, dusky skies were a deep, dark purple-blue. They provided an epic and seemingly endless backdrop as we meandered through marshland and through and between streams, rivers and ponds. The major climbs of the day were done, but the hills hadn't finished. We rolled our way up and down the final 40km and, as darkness finally set in, so did the cramp. We only needed to look at an incline for our calves and hamstrings to begin tightening and if the last few kicks weren't the final nail in the coffin, they were almost definitely the penultimate one. It was heads-down hour. The roads were quiet and so were we. We'd all silently agreed that this final leg was to be tackled alone, at our own marching pace. We'd reconvene at the top of climbs and chip away at this, staring intently at the narrow strip of road illuminated by our lights as bats began their working day overhead, bit by bit until it was done. At the top of the final climb, we were two of four. We stood, waited and listened. After a few minutes, we wondered whether cramp had finally got the better of Saul and Hendo and forced them off the bike. A few minutes more and we saw the flash of two lights and the silence was broken of what we thought was the sound of cleats scraping and scratching on tarmac. As they neared, we realised it wasn't. It was the unfamiliar but unmistakable sound of a chain and derailleur dragging against the road. Somewhere in the final ascent, an inner-tube that Saul had tucked into the top of his saddle bag had worked its way loose and into his rear cassette. That had then ripped his hanger clean off, leaving his derailleur and chain dragging limply and helplessly along the ground. We looked at the issue and knew we could do nothing. We still had 5km to our finish point. As had been the case for much of the day, there was nothing and no one around. Our only option was to get to our finish point by any means necessary. That meant freewheeling and scooting the remainder of the way. Thankfully, for the first time that day, the wind and the road were on our side. We sandwiched Saul between the three of us. One at the front, another at the back and the final to his right, we rode tentatively, squeezing the brakes as we were pushed by the wind downhill towards a hot meal. Put in a quiet corner of a busy restaurant in Torridon (is this where half of The Highlands population had been all day? ), we tried our best to formulate something that resembled a plan over haggis, pies, sticky toffee puddings and beers. We didn't get very far and much of what made its way out of our mouths as words made little sense and tailed off partway through. This was a challenge for tomorrow. Putting our wet kit into the airing cupboard and over every radiator available in our accommodation for the evening, we heard a loud pop and a slow, constant hiss from the hallway. Saul's tyre had burst, signalling the official end of day one.